More than 170 ancient Chinese bells unearthed from Shanxi, Hubei and Henan provinces are displayed in Beijing's Big Bell Temple in celebration of the 60th anniversary of New China's founding. Some of these bells are more than 2,000 years old. 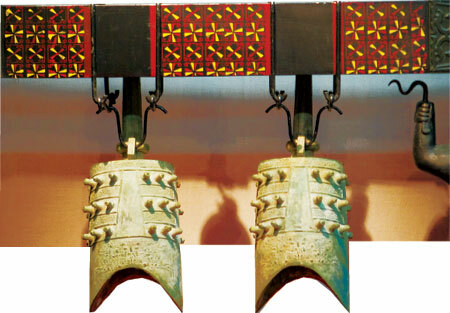 Bells were a milestone of Chinese bronze culture. Under ancient ritualistic and musical institutions, this percussion instrument was a symbol of its owner's social standing and was revered above all other musical instruments. Its design and function embody the best of the period's culture. These chimes serve as important material evidence that modern people can use to understand historical culture. In addition, nearly 1,000 other ancient bells made of bronze, iron and jade are presented in the temple's Ancient Bell Museum. Built in 1733 during the Ming Dynasty (1368-1644), it housed a giant Buddhist bell cast in the Yongle Period of the Ming Dynasty. The museum is the only one of its kind in China.